Medical Record Notes or MRNs are the body of your medical record for each patient visit. You will be able to attach a MRN to your record whether the visit is open or closed. 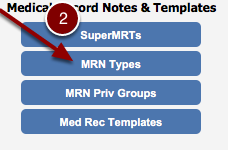 Within a MRN you are able to import MRTs and SMRTs to use a templates within your MRN. You will be able to create personal MRNs by following these easy steps. 3. Here you are able to create, duplicate and omit MRNs. 4. Select the first square button with the GREEN plus on the navigation bar. 5. List the ID, MRN name, Privilege Group ID, Report Category, Main Sort, Sub Sort, where you would like the MRT located and the status as active. When finished clikc into th eblue navigation area at the top of the screen and your new MRN will be saved.